CHARLESTON, W.Va. -- One-third of American adults and one in six children are now obese, although an annual report released Thursday by two nonprofit groups found that rates could be stabilizing. The report released by the Trust for America's Health and the Robert Wood Johnson Foundation found that West Virginia had the highest obesity rate at 37.7 percent. Mississippi was second at 37.3 percent and Alabama and Arkansas were tied for third at 35.7 percent. The report says the adult obesity rate increased between 2015 and 2016 in Colorado, Minnesota, Washington and West Virginia, fell in Kansas, and was stable elsewhere. Colorado had the lowest rate, at 22.3 percent. This is the first time in 14 years of conducting the annual report that any state's rate dropped, and rates of increases in other states have begun to slow, Trust for America's Health President and CEO John Auerbach said. The rankings differ slightly from a recent CDC report on obesity rates which had Louisiana in the No. 1 spot, followed by West Virginia, Mississippi and Alabama all tied for second. The new report recommends focusing on early childhood prevention efforts, including promoting exercise, expanding investments in community-based programs, increasing health-care coverage for obesity prevention and treatment, and improving school-based efforts to provide healthy meals and physical activities. "We conclude the report with a fair amount of optimism," Auerbach said on a conference call. "The adult rates are showing signs of leveling off and the childhood rates are stabilizing. In our review of the policies and strategies, we found that many (states) show a lot of promise for reversing the trends and improving health if we make them a higher priority." The study analyzed Centers for Disease Control and Prevention figures and used body mass index, a measure of height and weight. Those with a BMI of 25 to 29 are considered overweight; 30 and above is obese. The report noted that 25 states had obesity rates above 30 percent. In 2000, no state had a rate above 25 percent. 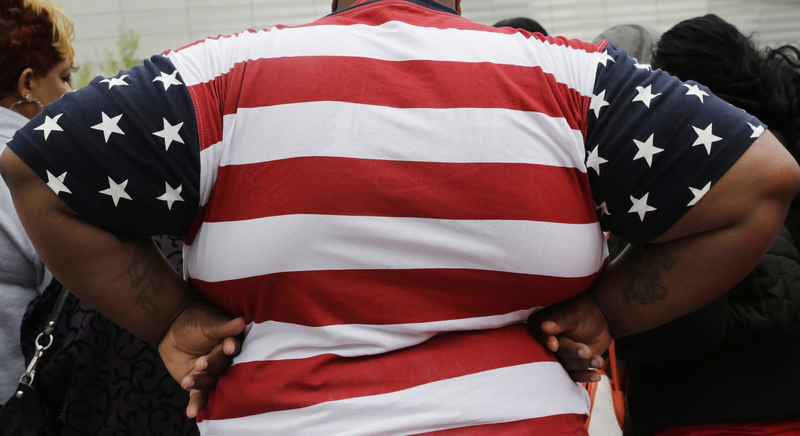 Nine of the 11 states with the highest obesity rates are in the South. States in the Northeast and the West had lower obesity rates. Auerbach said obesity costs the nation more than $150 billion in preventable health care costs and contributes to many different health problems. Those problems are particularly acute in the 13-state Appalachian region, which lags behind the rest of the country in 33 of 41 public health indicators, including seven leading causes of death, according to a separate study released last week by the Robert Wood Johnson Foundation, the Appalachian Regional Commission and the Foundation for a Healthy Kentucky. Obesity rates were higher among adults without a college education or with annual incomes below $15,000. The report also called obesity "a national security issue" that "impacts our nation's military readiness," noting that one in four young adults who tried to join the military were deemed ineligible due to fitness and weight concerns. "Being overweight or obese is the leading cause of medical disqualifications," the report stated. "Obesity rates are still far too high, but the progress we've seen in recent years is real and it's encouraging," said Dr. Richard E. Besser, the Robert Wood Johnson Foundation's president and CEO. "That progress could be easily undermined if leaders and policymakers at all levels don't continue to prioritize efforts that help all Americans lead healthier lives."